Negative ions are essential to life and reduction of them in our natural environment due to pollution, stress, high unnatural electrical frequencies and industrialization is major contribution to poor health. If there are inadequate negative ions in the cells then the cell channels will be closed thus nutrients cannot to past into the body cells nor toxins excreted. This accumulation of waste in the cell causes disease and pain. We can no longer get adequate negative ions from our environment due to pollution, poor quality food/water and other negative environmental impacts. We need new sources of negative ions which can be achieved through using negative ion products such as the Healthy Wave Mats. Negative ions are a very simple essential element to good health. Negative ions are one of the first building blocks required for every molecule in our bodies. Providing your body with extra negative ions just gives it the tools it needs to function correctly. Increases serotonin levels which can help alleviate depression, decrease stress, and boost our energy. 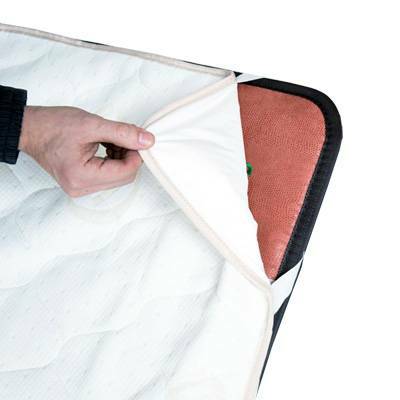 Reduce germs, allergens, dust and mold in the air. Fight free radicals in the blood. Improves the function of cilia in your respiratory system which protections your lungs from inflammation and irritation. Leads to less respiratory illnesses like colds, flus, hay fever and asthma. pH balance of body fluids. Negative Ions are an atom or molecule with an additional electron giving that atom or molecule a negative charge. 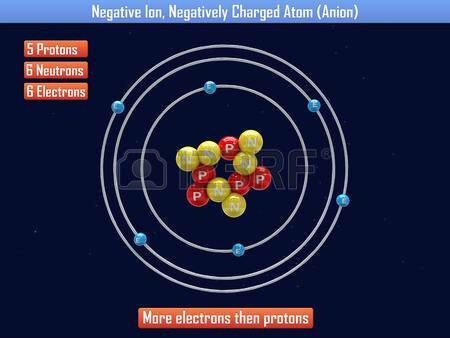 In contrast a positive ion is an atom or molecule that is missing and electron giving it a positive charge. Why do I need negative ions? To neutralize positive ions which are also known as “free radicals”. Positive ions or free radicals are missing an electron so the need to find an additional electron to stabilize themselves. The positive ion or free radical will pull an electron off a neighboring molecule which causes a chain reaction or cascade of free radicals as electrons are ripped from neighboring molecules damaging the cells. A damaged cell no longer function which is the beginning of disease and degeneration of the organs. This chain reaction and continue to occur causing atomic structures in the human body to start cross linking. Cross linking is when two similar atomic structures must share an electron to stabilize due to the missing electron. Cross linking can occurring in DNA which can lead to various effects such as aging and cancer. Additionally other cross linking can occur between the protein and fats in our body leading to wrinkles. For example LDL (Low density Lipoprotein) will start the formation of plaque in arteries when oxidation occurs. This can lead to heart disease and stroke. Cellar oxidation ( free radical damage) shorten life spans and lead to other degenerative diseases. 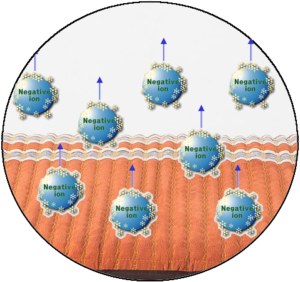 When we introduce negative ions we neutralize the positive ions (free radicals) so molecules become neutral. The addition of an negative brings the cells back to their natural state. Cross linking that has occurred can be undone if there is a surplus of negative ions for those atomic structures. Negative ions help in two was; neutralizing positive ions (free radicals) before they can cause harm and additionally repairing any oxidative damage done to the body caused by free radicals. By providing the body with ample negative ions we are able to slow down and even reverse the aging process while helping prevent diseases from occurring. Where do I get negative ions? The good news is there are ample negative ions available, but the bad news is there are an ever increasing amount of positive ions counteracting them in our industrialized environment. Historically there were 1.2 negative ions to every single positive ion in our environment. However this ratio has reversed and we are more likely to find 1.2 positive ions for every negative ion. The result is our bodies are constantly undergoing free radical damage to all the excess positive ions. That is unless we provide it a surplus of negative ions. As you can see natural areas that have not been developed and industrialized have a vastly larger amount of negative ions. Plants are one of the main producers of negative ions which are why we find so many in forests and areas with lots of plant life. There is no coincidence that studies have shown houseplants improve air quality. The negative ions they produce do more than help of bodies fight free radicals, the negative ions produced by plants will actually purify the air by neutralizing dust, mold spores, bacteria and allergens. In nature hot springs and waterfalls also have a surplus of negative ions which occurs in the journey the water takes. When water travels in nature it passes over rocks and clays picking up essentially minerals which also happen to have a surplus of negative ions. We can measure these negative ions by using an ORP ( oxidation reduction potential ) meter which can tell us if we have a surplus of negative ions of positive ions. We can benefit from these negative ions by being around waterfalls (absorbing them as they come loose ), bathing in the water the hot springs, or even drinking water with additional negative ions. You can achieve this by drinking alkaline anti-oxidant water like Cerra Water. The food we eat is also another important source of negative ions as anti-oxidants (negative ions) are found in vitamin A, vitamin C, vitamin E , beta carotene and superoxide dismutase. Unfortunately the majority of foods eaten today are low in these vitamins and minerals. This is largely due to mineral depletion in our soil. Over the last 100 years minerals in the soil has decreased 90%. Without the proper nutrients in the soil we are unable to get the proper nutrients from the food we eat. You probably do not live in a forest and are either in a house or office at your computer so right away there are not sufficient negative ions in your environment. You are also not getting the negative ions from your tap water as all city water is loaded with free radicals. Additionally the food we eat is also poor in the vitamins we use to get our anti-oxidants from due to poor top soil. Even if you are able to get the negative ions you need those will quickly be cancelled out due to high positive ion sources. The biggest source of positive ions is the EMFs from cell phones, wi-fi, power lines etc. The fact is unless you are living off the land in the forest your environment is full of positive ions (free radicals) and low in negative ions. We can supplement our bodies with the negative ions needed by using Healthy Wave Mats as they can generate over 1500 negative ions per cubic inch per minute. These negative ions are generated when we heat up the amethyst, tourmaline, jade & obsidian Healthy Wave Mats are made of. By concentrating these natural negative ions sources we can easily provide our bodies with the negative ions needed to counteract free radicals and oxidative damage. Lying down on a Healthy Wave Mat can provide your body with hundreds of thousands to millions to negative ions in less than 20 minutes. This can provides your body with all the negative ions it needs to regenerate every cell in your body with plenty to spare! You still should get out in nature due to the many other health benefits besides neutralizing positive ions and repairing oxidative damage. In modern society it will always be a constant struggle to receive the negative ions needed. By providing all your cells with a surplus of negative ions once per day with your Healthy Wave Mat your body can use this negative ion surplus to fight free radical damage that occurs throughout the day.